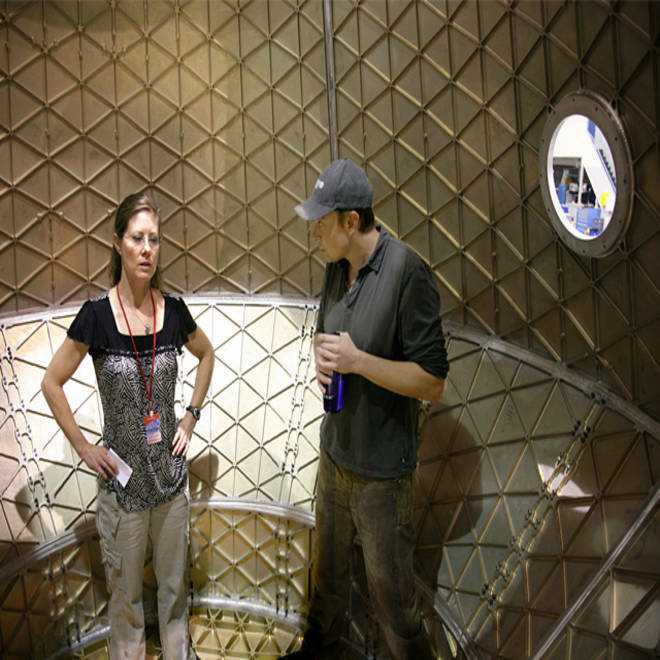 NASA astronaut Tracy Caldwell Dyson and SpaceX founder Elon Musk check out the interior of the company's Dragon capsule. When Space Exploration Technologies sends its Dragon capsule toward orbit atop a Falcon 9 rocket for the first time, hopefully sometime this week, the spaceship company's founder figures it will have only about a 60 percent chance of coming back down successfully. But for some reason, SpaceX CEO Elon Musk says he's feeling "calmer about this flight" than he did about the last one, back in June, when the Falcon 9 made its debut. For one thing, he's not having recurring nightmares about rockets crashing and burning. "There was something about me that couldn't just quite believe that I was the designer of a million-pound-class vehicle," he told me on Sunday. "I sort of questioned ... 'What the hell do I really know about rockets?'" The Falcon 9's maiden launch turned out to be nearly flawless. I guess Musk knew something about rockets after all. But that only raised the expectations for the second launch -- which is just about as risky as the first. This mission is drawing upon NASA's money instead of SpaceX's, and it's considered the first official demonstration flight in a test program that would turn SpaceX into one of the prime cargo carriers for the International Space Station. Sending up cargo will earn the California-based company $1.6 billion over the next six years. If NASA ever gives the go-ahead, SpaceX's Dragon could someday carry astronauts as well as food and supplies into orbit. So it's no wonder that this launch -- which is aimed at launching the Dragon and bringing it safely back to Earth after up to four orbits -- will be as closely watched as the June liftoff. Launch had been scheduled for Tuesday, but SpaceX and NASA said today that the mission would be put off until Wednesday or Thursday, to give the company's engineers time to check out a potential problem with a second-stage rocket engine nozzle. Musk, a 39-year-old dot-com millionaire who has put more than $100 million of his own money into the SpaceX venture, is trying to play down the expectations. First, he estimates the Falcon 9's chances of success at 90 percent. Then he sets the Dragon's chances of getting into orbit and back down to its Pacific Ocean landing zone successfully at 70 percent. Multiplying together those probabilities yields a figure of "60 percent or thereabouts," he observed dispassionately. "Historically, the track record for the second launch of a new vehicle is not that great," he said. "The statistics improve dramatically around launch 3 and 4." An artist's conception shows the separation of the SpaceX Falcon 9's second stage, with a gumdrop-shaped Dragon capsule on top. Even if Dragon gets into orbit, but burns up on its way back down, "I would still call that 75 percent success," he said. That would at least suggest that the Dragon could safely deliver cargo to the space station, he said. But of course he's hoping for 100 percent. "The big test is, is our heatshield going to be able to withstand the extreme heat of re-entry?" Musk said. 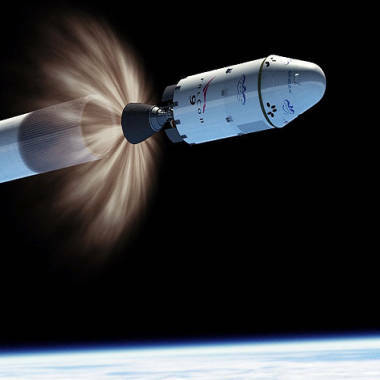 To maximize the Dragon's chances, he said his company's engineers have gone for a bit of "overkill" on the carbon-based heatshield material, known as PICA-X. Even if the Dragon makes it back down intact, lots more testing lies ahead. Next year, SpaceX plans to send up a Falcon 9 with a Dragon that would approach the space station, and perhaps even hook up with it. If the Dragon doesn't dock during that flight, that task would be left for a third NASA-backed demonstration flight. But if it does, SpaceX would seek to go straight on to its cargo delivery schedule. It's been a long haul from SpaceX's founding in 2002, which was backed in part by Musk's share of the proceeds from the sale of PayPal. Today he serves as SpaceX's chief executive officer as well as chief technology officer. And as if that's not enough, Musk is also chairman of the board for Tesla Motors, an electric-car company; and for SolarCity, a solar-power startup. 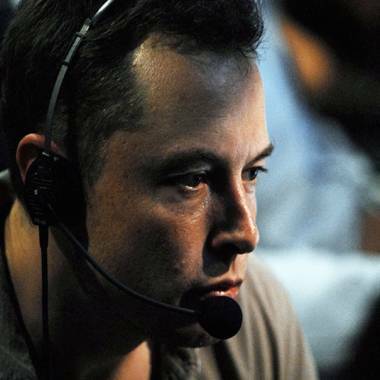 SpaceX's Elon Musk monitors mission control operations during a test. Why does he do it? Musk said that if he was in this just for the money, he'd go back to setting up Internet ventures instead. "Making money there is like falling off a log," he said. "I'm sure I can make something better than, say, FarmVille." He's been open from the start about his reason for sticking with SpaceX: This is part of his personal quest to help humanity get off Earth, move on to Mars and become a multiplanet species. The way Musk sees it, that's the only way to guarantee that humans will survive a surprise asteroid assault or a disaster of our own making. He believes the off-planet strategy is "an insurance policy on life as we know it." As wild as that view might sound, Musk told me that he's been getting a "quite good" response, even from budget-conscious members of Congress. He's even starting to think ahead to the next giant leap -- the development of a super-heavy-lift rocket, more powerful than the Apollo era's Saturn 5, which could put 150 metric tons of payload into Earth orbit. Musk said facilities in Utah, Alabama, Ohio, Florida and other places around the country could be involved in the project, and he's willing to build the rocket for $2.5 billion. "Anything above that, SpaceX will pay for," he promised. That's aimed at making sure the rocket capable of getting to the moon and Mars actually gets developed. "If it's yet another program that spirals out of control in cost and time, then it just gets canceled," he said. The way Musk sees it, going to other worlds is just an extension of the course laid out by Christopher Columbus and Vasco da Gama 500 years ago. Just as Lewis and Clark led a Corps of Discovery 200 years ago, a new corps of discovery will rise to the challenge -- as long as they have the vessels for the journey. "The thing that's troubling is that ... NASA needs companies to build the ships to carry the Vasco da Gamas, and the Magellans, and the Columbuses," Musk told me. "If Columbus didn't have a shipbuilding industry that could build ships to cross the ocean, there would be no America. We're making those ships. I will do everything in my power to make that happen." President Barack Obama's deficit reduction commission caused a stir among some space policy watchers by targeting the funds that had been proposed for supporting the development of private-sector spaceships. Musk said he was glad to see that the criticism of space commercialization didn't appear in the commission's final report, but he said he understood Congress' desire to curb deficit spending. When it comes to space spending, Musk said "the best way to tackle the deficit is competitive, commercial resupply of the space station and competitive, commercial crew [transport] ... the alternative being to quickly cancel the space station." He said paying hundreds of millions of dollars a year to the Russians "does not sit well with Congress." Musk said his $2.5 billion figure for a super-heavy-lift rocket was based in part on the concept that 80 percent of the money Congress is expected to devote to heavy-lift development would go toward the standard cost-plus method for funding spacecraft development, with 20 percent going to the kind of fixed-price, milestone-based approach that is being used for the NASA program that's funding SpaceX's effort. "I find myself in this bizarre position where people are saying, 'You couldn't possibly do it for such a low amount as $2.5 billion,'" he said. "And actually, I have trouble trying to figure out how we'd spend so much money. In order to get to $2.5 billion, I'd have to assume that a whole bunch of things go horribly wrong during the development process." Lately, Musk has been getting more of the celebrity treatment. For example, his recent marriage to actress Talulah Riley took on some of the trappings of the tabloid press. Numerous news reports have noted that Musk served as actor Robert Downey Jr.'s model for the lead role in the "Iron Man" movies. Musk said he saw celebrity as a "double-edged sword. ... If somebody told me when I was in this that I would be in any way a celebrity, I would actually have said that I would prefer not to be." But now he realizes that the public spotlight can have a purpose. "I have come to the conclusion that if one should try to rally the public around a goal, they've got to know who I am," Musk told me. "I'm probably going to have to increase this somewhat, because I really want to get at like-minded individuals who ... really care about advancing the cause of space. People who believe that there have to be inspiring things in the world. Life can't be just about waking up in the morning and solving problems. We need reasons that make life worth living. Apollo was one of those reasons. Being able to go out there and try to create a new planet -- I can't imagine a more exciting adventure." Connect with the Cosmic Log community by "liking" the log's Facebook page or following @b0yle on Twitter.